For an explanation of Historic Land Measurement - click here. All things which grew and which increased annually e.g. grain, vegetables and wood. All things which were nourished by the ground such as lambs, calves, etc. and also animal produce such as milk, hides, eggs and wool. The produce of man’s labour, particularly the profits of mills and fishing. Tithes were also classed as being great or small. Great tithes were derived from corn, other grains, hay and wood. These tithes were commonly payable to the Rector of a parish and were therefore also called 'rectorial' tithes. The 1589 Terrier occasionally specifically refers to "the Tithes of Corn and Hay". Rectors were often remote from the parishes, so a deputy or Vicar was appointed to act as the parish priest. Because the Vicar was not entitled to the great tithe, it was usual to provide him with the small tithes (worth about a third of the total tithe of the parish) as a basis for a living. Small tithes were derived from all other things that grow, such as vegetables, fruit, hops; also animals and animal produce, as well as milling and fishing profits. These were all commonly payable to the Vicar of the parish and therefore also called 'vicarial' tithes. The difference in income between the Rector and the Vicar could be considerable, with the bulk of the tithe income often going to an absentee Rector. Some Vicars did their utmost to increase their income by making such produce as acorns or fallen apples tithable. At the Dissolution of the Monasteries, many of the great tithes passed into the hands of laymen, who became the new owners of the church land and its accompanying rectorial tithes. The payment of tithe was a cause of endless dispute between the tithe owners and the tithe payers. In addition, Quakers and other Non-Conformists objected to paying any tithes to support the established church. Almost every agricultural process and product attracted controversy over its tithe value. By the eighteenth century the complex legislation surrounding the tithe began to have a detrimental effect on the increasing numbers of farmers working for agricultural improvement. Tithing was seen as increasingly irrelevant to the needs of the community and the developing agricultural industry. A land terrier is a record system for an institution's land and property holdings, in the case of Yeovil the Terrier of 1589, known at the time as a 'View of the Parsonage of Yeovil and Pitney' was compiled for the Church's holdings. The word 'terrier' derives from the Latin terra, meaning land. From early times, money payments had begun to be substituted for payments in kind. By 1836 tithes were still payable in most of the parishes in England and Wales, but the Government had decided on the commutation of tithes. In other words, the substitution of money payments for payment ‘in kind’ was to be introduced across the country. As a consequence the Tithe Commutation Act was passed in 1836. Three Tithe Commissioners were appointed and the long process of commutation began, with Assistant Commissioners stationed around the country to oversee implementation of the Act. These money payments were not to be subject to local variation. The Act proposed a fluctuating money payment adjusted each year and based on the average price of wheat, barley, and oats. It was hoped that an annual review of the payment for each tithe owner would reflect the variable nature of the amount of farm produce in good and bad harvests, and preserve the purchasing power of the payment. Every piece of land subject to tithe was to have a monetary value assigned to it and a record was to be kept so that a prospective purchaser of land would know exactly what he would have to pay annually to the tithe owner. In this way the value of a piece of land could be measured against its tithe obligation. A survey of the whole of England and Wales was therefore necessary. Enquiries were sent to every parish and township listed in the census returns, and meetings took place all over the country to find out how much commutation had already taken place. The Commissioners then established Tithe Districts to distinguish them from parishes. Most Tithe Districts corresponded with parishes, but the Commissioners could, if necessary, form separate districts. Many parish boundaries came under close scrutiny, perhaps for the first time in centuries, and maps showing these were drawn up. We now call these tithe maps. This huge effort to survey the country in the 1840s gives us the first detailed view of the rural landscape of England and Wales. The Yeovil Tithe Map was surveyed and drawn up in 1842 by local surveyor and cartographer E Watts, who had been producing local maps since at least 1806. The tithe maps and apportionments are an important source of information about the history and topography of the parish. They provide details of land ownership and occupation, and the type of cultivation of the land, and are often the earliest complete maps of parishes. They were produced in order to assess the tithe payable in cash to the parish church for the support of the church and its clergy. This tithe had been paid in kind until The Commutation Act was passed in 1836, when it was agreed that this should be converted to a monetary payment. A survey of the whole of England and Wales was undertaken in the decade or so after 1836, to establish the boundaries of each parish, and assess the amount of tithe due for each parcel of land within it. This resulted in the survey of all titheable land in each parish, the production of a map covering the whole parish and a reference book (apportionment) identifying each plot of land. Yeovil's Tithe Apportionment was ready by 1846. 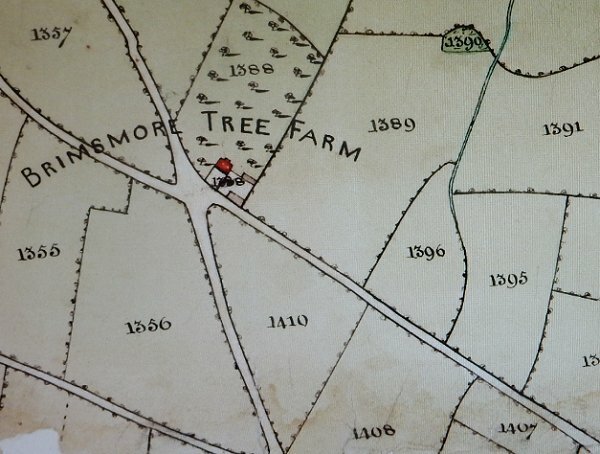 Part of the 1842 Tithe Map showing the fields around Brimsmore Tree Farm. Each field was numbered and the corresponding number entered in the Tithe Apportionment together with the details such as Owner, Occupier, acreage, use and tithe amount. For example, Parcel 1356 at lower left was a pasture called Lockyer's Ground, its area was 9a 1r 9p, it was owned by John Winter and occupied by Joseph Brooks. The original map was coloured with pale watercolour washes. Sadly the Tithe Apportionment does not list all the properties.